1.Large blue LCD display interface，user-friendly. 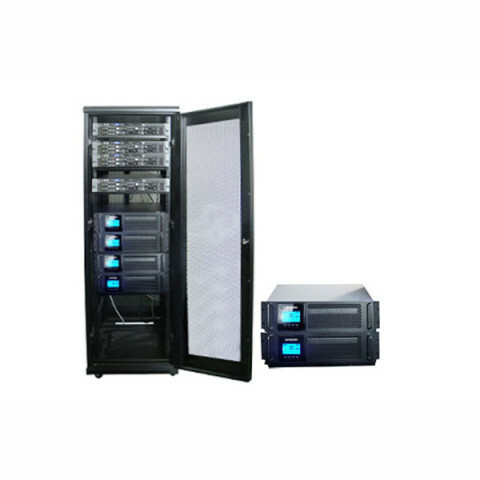 Pure high frequency online UPS，with voltage adjustment circuit,provide reliable power protection in the bad operation environment. 2.Comprehensive electric isolate and bypass protection. 3.Input power factor correction, reduce the harm of harmonic to the power grid,convenient to match small generators. 4.Automatic alarm, self test function. 6.Input neutral and live wire detect and data protect function. 7.When main power failure, the UPS going to DC start,Convenient and reliable; when main power recover,UPS restart automatically. 8.N+X Parallel Redundancy and Capacity expansion for 6K-10K. The concept of regional power supply is introduced in the design of high frequency machine, which is a combination of centralized and distributed power supply topology. If several regions separately in a large room of data, each region configuration a set or two sets (redundancy) 3A3 UPS online 10kva power supply system, placed directly in the regional load beside, power is supplied by the cabinet on the switchboard. In this way, each area is centralized power supply, centralized management, and the region is separated from the independent power supply, wiring is also independent. 3A3 UPS online 10kva power supply mode with the advantages of distributed flexible, allowing the gradual investment, not easy to produce a large area of paralysis, but also easy to manage. If the UPS redundancy is above two modules, the availability of UPS 10kva online can reach more than 99.999%, and the MTBF (mean time to failure) is more than 15 million hours. If the failure of the UPS module is less than or equal to the number of redundant UPS module, can replace the failed UPS module online without affect the work of other modules, in this case, downtime is zero. If the number of UPS module is greater than the number of redundant UPS module, as it is the way to replace the UPS module to maintain, so downtime will not be more than 5 minutes.